So you've decided to register your business as bicycle friendly, add a map listing for your location and promote your services to cyclists! This is great news! If the Ontario By Bike Network is already offered in your region, you may now join at any time*. Remember there is currently no charge for your business to participate, as this is a FREE service that is made possible through funding support from our regional and destination partners. We would like to assist you in getting your business registered. You can do this on your own by following the steps below, or if you require some assistance navigating the website, we'd be happy to help. If you're calling long-distance, call our toll-free number 1-866-701-2774 or 416-827-2774. We suggest visiting www.ontariobybike.ca/join-the-network and reading the program details thoroughly. Review the Certification Crtieria for your business category and ensure you comply with each of minimum requirement for your category. Visit add your business here and create a user account. You will receive an email in your inbox that has a weblink that requires you to verify and activate your account. After you have activated your account, return to www.ontariobybike.ca and log-in using your account details (top right of the page). If you enter your username and password correctly, you will automatically be returned to the Login Area. Scroll down the page, and displayed you’ll see a variety of Map Category Icons relating to various business categories. Click on the appropriate icon category for your business. This will bring you to a directory of all of the businesses certified under this category. Under the main image, click on the navy blue box that reads – “Add your listing here”. Add your business details, click "locate on map" to add your listing to the map, and then click "submit“. The Ontario By Bike Network will review your application and notify you when the listing is published. Once published, an Ontario By Bike staff will send you a “Welcome Package”, which will include a regional tool kit, Ontario By Bike rack cards, an Ontario By Bike Window Decal and other marketing and administrative correspondence. While we suggest you register your business using our online system, we recognize that some still prefer the paper version. Download a registration form, mail it to us and we can take care of setting up an on-line account. However by doing so, the participating location loses access to account and without contacting us directly will have limeted capabilities to make changes to information. Download form HERE . 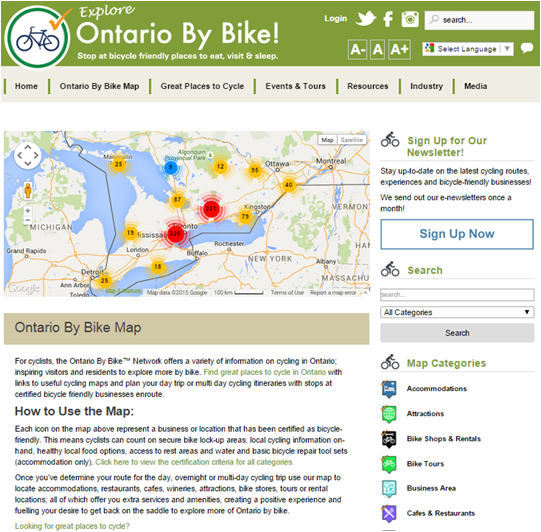 Existing participating locations who wish to edit a listing should login to their account, locate their listing using the Ontario By Bike Map or through the search option and click on the navy blue box that reads - "Edit" or "Edit Listing". Proceed to edit and then save your listing updates. You can always contact Ontario By Bike through email - info(at)ontariobybike.ca or call 1-866-701-2774 if you require assitance in accessing your account.